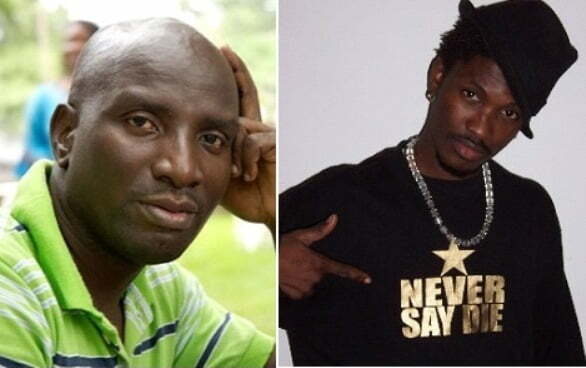 From all indications, the feud between rapper Tinny and move producer Socrate Safo has not been solved. The musician in a recent interview with Hiz FM’s Mzgee has sent a serious and unrelenting message to the Hot Fork producer. Tinny during the conversation with the Multimedia presenter denied allegation that he once threatened to kill the Chief Executive of Movie Africa Productions, Socrate Safo, with a gun. According to him, it’s illegal in Ghana to pull a gun so he will never try such an illicit act. “I’ve never and ever said I’m going for Socrate with a gun before. That is too much for me. The brand Tinny is not only for adults, kids also love me so I can’t be doing that. When maybe I pull a gun, I can’t say I’m going for this person because they can jail me for that” Tinny told Mzgee. Commenting on his relationship with the controversial movie producer who also doubles as entertainment critic, the artiste known in real life as Nii Addo Quaynor made it clear that he is not cool with him. He stated that he will be friends with him only when Mr. Safo desists from making defamatory comments about Ghanaian musicians. “Socrate is the type that doesn’t give up and I’m also too stubborn to give up. When he stops those kind of comments about we the musician, he will be free. “Do something for yourself so that when you are talking, people will really pay attention to you. You are not doing anything for yourself and everyday you are always making noise. You have to shut up.” Tinny concluded. The back and forth between Tinny and Socrate started on Peace FM months ago when the artiste appeared on the show to promote a remix of his ‘Badder Than Them’ track, featuring Jupiter and Edem. While Socrate thought the new song was put out for a critical and honest review, Tinny and his management said they brought the song for promotional purposes. After the song was played, Socrate said the only thing he could hear in it was the noise from a “badly played or spoilt accordion”. He also told Tinny to be ashamed for paying the sound engineer for the song. Tinny, after the show stated that Socrate hates him. He subsequently released a diss song titled “Socrate Atanfo” to attack the movie producer. Socrate threatened to sue the musician but nothing has been heard about the lawsuit as at the time Zionfelix.net was publishing this story.